The Parasite tier 7 skill on the Witch Doctor: “Launch a parasite at an enemy, dealing X damage over X seconds. If a target dies while under the effects of parasite, a zombie dog emerges from the slain body.” Will this summon Zombie Dogs if you don’t have any points in the tier 1 Zombie Dog skill? Do dogs summoned this way count towards your Zombie Dog cap? Do they have a timed life? Wtb some more info please. I’m reluctant to give any details as it seems to function in sort of an odd way right now. I’m not sure it’s working properly and I’d rather not give false information out. Also, on the official website, I have a question about Screenshot 57. I’m writing a story based on this screenshot. 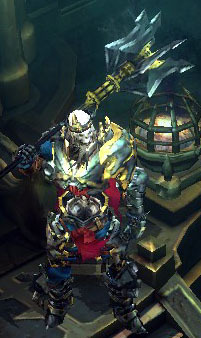 Where exactly is this in the Diablo world? That was the starting location for the first playable demo we ever had. Those are the front gates to Tristram, sometimes (incorrectly, even by us) called Old Tristram. It’s changed quite a whole lot, but that sort of gated entrance to Tristram still exists, as well as the concept of burning corpses before they rise as the living dead. Also, Bashiok, does the player still start the game standing in front of these gates as in the demo you mentioned? Or has that been changed as well? No, but not far from it. I’d say there’s about ~5 minutes of ‘game’ before you reach that point. I’m thinking this year’s demo was actually in the middle of the demo from ‘08. Something like that. But stitched together in specific ways. We have posted full skill info for the Demon Hunter, Barbarian, and Monk, but alas not yet for the Witch Doctor or Wizard (tomorrow!). However since all that’s known about the WD’s Parasite is the skill hover, which I added to the OP’s comment, you’re not missing out on anything there. As for the other question, it shows the peril or relying on the official site’s inadequate gallery. Not only does it only feature a small % of the total screenshots and artworks thus far released, there are no captions with added image info, whereas our gallery has every image released, and informative captions on all of them. Including the one this user asks about. It’s thumbed above. As for that shot, that town scene was exactly the starting spot for the 2008 Blizzcon demo. I played it enough times to remember. The Wizard in that screenshot has moved at most a single step from where she first appeared, facing Captain Rumford, with Mr. Meat Wagon going about his grim business in the back. It’s interesting to know that it’s not the start of the game now, but that it takes about five minutes to get to. 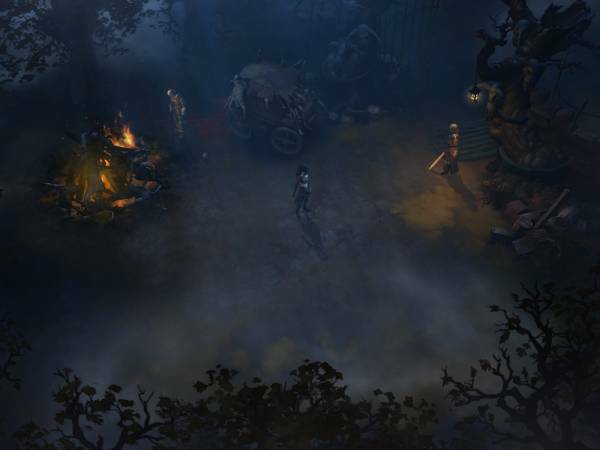 I bet we’ll start the game out at the edge of the woods around Tristram and must battle our way there; they’ll throw us right into the fray in D3, rather than starting new chars in even the most rudimentary sort of town. As for the demos vs. the final game’s Mad King quests and levels, it’ll be fascinating to see the whole thing. The 2008 demo had 3 dungeon levels. The first was exploration, on the second you found Leoric’s Crown, and after working through the numerous undead set pieces on the third level, you reached Leoric’s throne and skeleton, dropped the crown there to awaken him, then fought him and his laughing minions. That demo version was greatly simplified from the final game, since we saw in the Artisan video that multiple pieces of Leoric’s crown had to be found, and then in this year’s demo we explored two large dungeon levels, both connected to Leoric, but neither containing any pieces of his crown, or anywhere near the lowest level. As Bashiok said, “stitched together” in various ways indeed. Act One in the final game will doubtless feature numerous related dungeon levels before reaching King Leoric, but he will not be the final boss of the act, since we’ve been told that Act Bosses are huge encounters, much bigger than anything yet seen in the game. Diablo III Playable in Sweden?